This fascinating CD presents all the Elgar pieces written for solo piano and including some of his piano versions of pieces better known in orchestral guise. It is a well presented disc with authoritative notes by the pianist. These illustrate the difficulties he had in preparing some of the scores for this disc. All his life Elgar had played piano improvisations for himself and his friends. In 1929 he improvised five pieces straight onto HMV�s hot wax recordings. 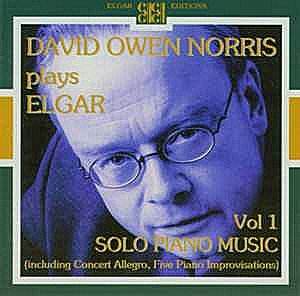 They were never written down by Elgar but this has been done by Norris, based upon those recordings and are played here. They are substantial works, fascinating to listen to. The fourth Improvisation is based upon the slow movement of his unfinished Piano Concerto. Another major work is the Concert Allegro of 1901. This had a first performance by the famous pianist, Fanny Davies and had a poor reception which induced Elgar to make savage cuts and alterations. Norris presents evidence to indicate that the fault lay with the pianist, not Elgar. With difficulty Norris has reconstructed the original version which is played here. It sounds great! Another almost unknown masterpiece is the short work In Smyrna written when Elgar took a Mediterranean cruise: it is a perfect tone poem on the spirit of the east. Piano versions of the well-known Imperial March and Three Bavarian Dances are played with verve. The remainder of the disc is filled with short pieces in which Elgar was so proficient. A mazurka, Chantant, written when Elgar was 15 is most enjoyable as is the brilliant Presto. The disc ends with a short prophetic piece called Adieu which was one of the last works Elgar completed. The playing and recording throughout is excellent. This is No.2 of the Elgar Monographs and contains six essays on different topics relating to Elgar�s life and music. Elgar and the two mezzos is an instructive tale of the composer�s relationship with two mezzo-sopranos who had sung in his compositions, he clearly preferred one and we are told how he managed to turn down the other with some tact. This is an area of the composer�s life we seldom hear mentioned. We are given a sympathetic description of the work of James Whewall, organist and director of the North Staffordshire and District Choral Society which performed Elgar�s works � notably in the first London performance of Gerontius. A detailed description and history is given of Elgar�s piece "The Music Makers" which is based on an Ode by Arthur O�Shaughnessy who was an unsuccessful zoologist who worked for the British Museum. Another musical essay is about an obbligato to Land of Hope and Glory written by Elgar and played by the bells of the Ottawa Peace Carillon at the celebration of the Diamond Jubilee of Confederation in 1927. In 1921 it was conceived that a Doll�s House should be built for Queen Mary. Sir Edwin Lutyens, the architect, designed and organised the project. It was a fantastic detailed model with lights, lifts and hot and cold running water etc. � all working. He wrote to Elgar asking for a contribution; Elgar was affronted and refused. All this is described in fascinating detail. Although David Bury admires Elgar, he is not immune to his faults and at one point comments "�we are dealing with a notoriously thin � skinned person of volatile swings in mood, who frequently exaggerated.. [and] was not averse to being economical with the truth." These remarks need to be borne in mind when reading about �Elgar and the Awful Female�, the story of his involvement with the new Shakespeare Theatre at Stratford on Avon and its architect Elizabeth Scott. A most intriguing story which brings this interesting short book to an interesting end. In 1903 Edward Elgar and his friend Troyte Griffith, both living in Malvern, held discussions which led to the formation of a Concert Club. This was to hold performances of chamber music given by "the best available artists." An initial concert was given by the Brodsky Quartet and a general meeting held which elected Lord Beauchamp as President, Dr. Edward Elgar as Vice-President and Chairman: Troyte Griffith and Jebb Scott were appointed as joint Secretaries (although the latter moved away the following year). The book gives a detailed history of the first 100 years of the club�s activities; gives the programmes of all concerts, notes about the performers and in many cases extracts from newspaper reviews. Thus we receive information on perhaps most of the leading British players of chamber music (including solo artists and singers) of the 20th century and on many of the overseas artists who appeared at this prestigious club. Although Elgar helped found the club and retained the Vice-Presidency for many years, he was very busy and moved away from the area and therefore played little part except in the early days: his daughter Carice however was deeply involved for most of her life. The Club had good times and periods of difficulty however in the last quarter century it has gained a bigger membership than in the early years and has now expanded its activities to hold some concerts with Chamber Orchestras and other medium sized groupings and can face the future with some confidence. Michael Messenger has obviously undertaken considerable research and writes clearly.